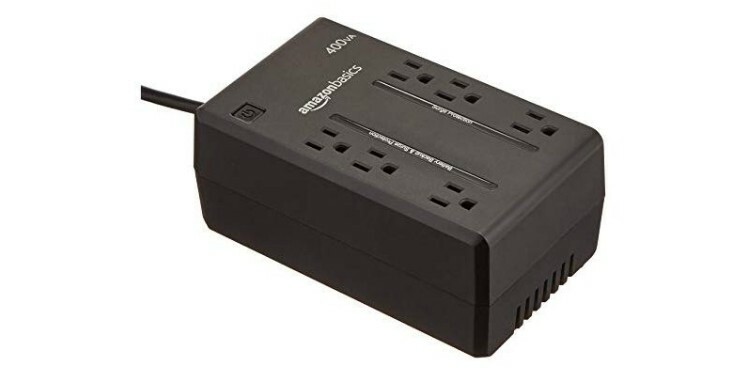 Home Reviews Buying Guides What Is The Best UPS (Uninterruptible Power Supply) In 2019? If you’ve spent hundreds of dollars on a desktop PC or gaming console, then you need a UPS, or uninterruptible power supply. There are many uninterruptible power supply options to choose from on the market. In this article, we’ve boiled down the best of these options to five top selections. Whether you’re using a low-power laptop, a console, a high-end gaming PC, or anything in-between, one of our recommendations should suit your budget and your needs. If you aren’t already sure what you need, feel free to scroll on down to our buying guide at the bottom of the article. We’ll walk you through each of the main specs listed, and help you make the right selection for you. 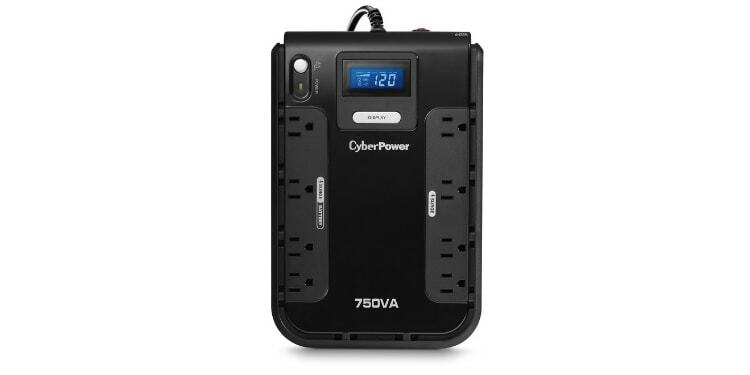 Our first entry for this list is the AmazonBasics 400VA UPS. We don’t recommend this one for desktop PC users. There just isn’t enough wattage for this UPS to support most desktops, especially modern ones, though there may be some HTPC and SFF form factors PCs out there to counter that point. With a wattage limit of 255 Watts, though, this UPS is much more ideal for those who want to protect their gaming console and TV. The maximum power draw of the Xbox One X is roughly 175W, according to the Digital Foundry review. PS4 peaks at 250W in the absolute worst-case scenarios, with PS4 Slim having an even lower power consumption number. With an Xbox console or PS4 Slim, you should be able to power your TV as well. PS4s will require a bigger UPS to also support a TV, and PS4 Pros will require an even bigger UPS yet, in general, as well. In addition to gaming consoles, a low-end UPS like this one could also be used as a charger for a laptop or tablet in a desperate situation. While this downside can be mitigated with the 600VA or 800VA versions, its main fault is actually found in its software, which is rather barebones. It doesn’t even feature auto-restarting for those scenarios where the power comes back on. You’ll have to manually reset the unit yourself for this functionality, or have a nasty surprise when you keep running on your backup power supply until it’s out. Finally, there is also the lack of voltage regulation and a limited 1 year warranty. Compared to the standard 3 years offered by every other unit on this list, this is somewhat lacking, and betrays a lower-quality product. If this unit otherwise fits your needs, its price can’t really be beat. Otherwise, take a look at our other selections. 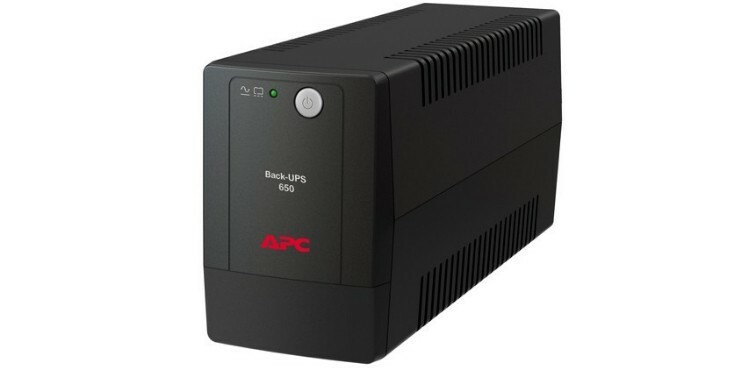 Next up is the APC 650VA Back-UPS unit. The 650VA here translates to 390W, which makes it ideal for full console + TV setups, as well as low-power PC setups. In terms of PCs, you aren’t likely to be able to use this with budget gaming PCs. Even when their real wattage requirements are lower than the 390W target of this unit, you still face the issue of power supplies with low efficiency. Unless you’ve calculated your max wattage to be 350W or lower and you’ve invested in a 400W PSU with 80+ Gold Certification or better, you probably shouldn’t use this with a budget gaming PC. Where this UPS will come in handy is as a unit for low-power PCs and consoles. Many prebuilt HTPCs and office PCs, for instance, will have much lower wattages than the 390W target required by this unit. The gaming console with the highest power consumption (the PS4 Pro, at 310 Watts) also leaves generous room for a medium-sized HDTV to share the battery backup on this unit. The bigger benefits of APC’s budget UPS unit versus the AmazonBasics unit aren’t just in wattage, though. For your extra money, you get a 3 Year warranty, an auto-restart functionality so you don’t accidentally drain your UPS’ battery backup, and overall much better management software. Even if your basic power needs are met by the AmazonBasics unit listed above, we recommend bumping up to this one for a bit more flex room and quality of life improvements. If you’re looking for a computer battery backup, then you’re in luck; we’ve finally reached a UPS good enough for desktop PC usage. As you may or may not know, most actual PC power consumption is well under 400W, even with high-end components. Modern PCs especially have low power requirements-- my own PC at max load shouldn’t ever exceed 310 Watts, for instance. With an 80+ Gold-certified PSU, that means I should be consuming a maximum of ~370W, with a fair 50W remaining for my monitor and peripherals. Not bad, right? Well… that is a little bad, actually. At least, it is bad if I were to be running my system at max load when my power goes out, since I would be dangerously close to meeting my maximum threshold. My PC is actually pretty old, though-- what about a newer gaming PC? Looking at our gaming PC build, these parts combined should never consume more than 250W. With an 80+ Gold Efficiency PSU, that’s about 300W of maximum power consumption. This leaves roughly 120W of power free for peripherals and a monitor, which is a much safer range to be working within. You’ll want to calculate the exact power draw of your desktop PC to be sure, but any modern midrange gaming build or prebuilt PC should fall well under the limitations of this PSU. In addition to the high-enough-for-proper-desktops wattage, you also have the added benefit of better software, auto-restarting functionality, and even a nifty little LCD panel to work with. This UPS is definitely going to be popular for the midrange gaming PC owners. All the extra wattage here should be suitable for a fully-fledged gaming setup. That means a large TV, speakers, or multi-monitor setup should all be within this UPS system’s capabilities, so long as you aren’t pushing its maximum with your PC by itself. The built-in display will also serve as a great way to measure your power consumption in real-time, so you know for a fact whether or not you’re pushing this UPS too far for its own good. 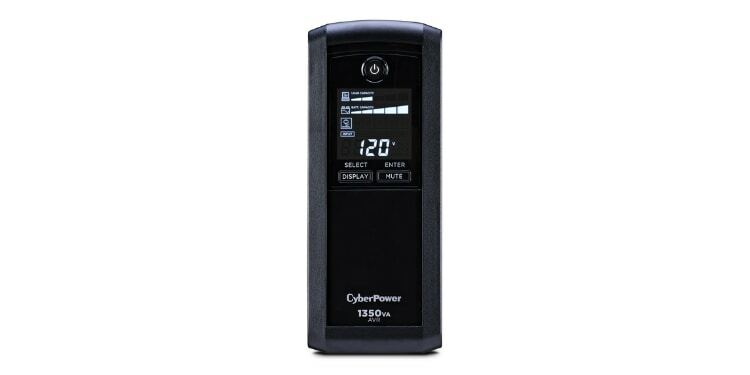 In terms of battery life and software features, CyberPower offers quality up there with the best in the industry, including APC. Plus, you also have the added benefit of voltage regulation with this unit, which should come in handy in areas with particularly poor or inconsistent power. The only real downside with a UPS like this one is its high price, but if you truly want to protect your tech investment it’s worth every penny. 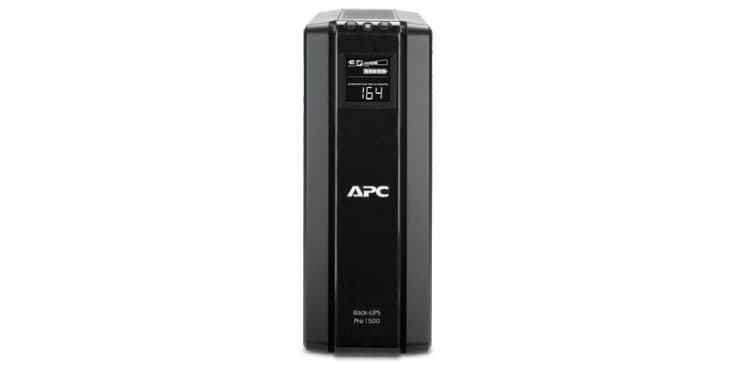 If you refuse to settle for anything less than the best, the APC Back-UPS PRO 1500VA is the right uninterruptible power supply for you. Its 1500VA/900W capacity should be more than enough for any modern gaming PC, as well as any monitors, TVs, speakers, or any peripherals you have plugged into it. In addition to the crazy-high capacity, you also have stellar build quality and software. As the “Pro” in its name implies, this is a UPS intended for professional use, and it shows in its features and quality. All of the most important features are here: USB interface, great quality, great capacity, and a built-in LCD display to monitor your UPS. We really only have one downside of note for this unit: its high price. This is the most expensive unit on this list, and is the highest-end UPS available to consumers. If you have truly high-end hardware, though, this is worth every penny. What’s an extra ~$170 to protect $1,000+ in hardware? In this section, we’re going to explain why you need a UPS and what you need to know when buying trying to find the best battery backup. Let’s hop into it. As the name implies, an uninterruptible power supply is just that: uninterruptible. This means power surges, blackouts, brownouts, and any other power-related problems won’t result in your UPS going offline. The UPS will only turn off if its battery is emptied, it’s turned off manually, or it is physically destroyed by an outside force. Otherwise, these machines are built to be durable and to resist even the worst power conditions. The purpose of an uninterruptible power supply is to protect whatever is plugged into it. For a PC user, this means your PC and your monitor. For a console gamer, this means your console and possibly your TV, though you can safely turn off modern consoles using only the power button, unlike with desktop PCs. This same logic can also be used for non-PC or non-console devices, like Smart TVs or media players. In the case of electronics, especially “smart” electronics like a PC, console, or smart TV, clean and consistent power is integral. With power surges or outages, you risk damaging or destroying the entire system, especially in the case of a power outage. If you’re also using your PC for important work, a sudden power outage can result in all of that work being lost. To protect your likely expensive investment, an uninterruptible power supply is integral. This applies especially to areas that suffer from frequent power outages, particularly rural areas, extreme climates, or places with bad power grids. In order to buy the right UPS, however, you’ll need to make sure that some basic requirements are met. The most important of them is wattage, which we’ll explain just below. Note: If you have an older high-end PC or are overclocking, you may want to use a wattage measurement tool or wattage calculator to find your actual max power consumption. Wattage is the most important factor to consider when buying a UPS. The UPSes we’ve listed all come with VA and wattage ratings. You don’t need to worry about VA– it’s a different measurement for the same thing, and we’ve included the wattage ratings for each of the UPSes we have listed above. To get a better idea of what you need, we’ll list common wattage ranges below. 200W – Enough to power a gaming console and a PC monitor or small (sub 30-inch) TV. 400W – Enough to power a gaming console and a large TV, or a desktop PC with a standard PC monitor. 600W – Enough to power a budget gaming PC and a standard PC monitor. 800W – Enough to power a midrange gaming PC and a standard PC monitor. Depending on PSU efficiency, possibly a larger TV. 1000W+ – Enough to power a high-end gaming PC and, depending on PSU efficiency, a larger TV. As a PC user, you’ll always want to opt for a UPS with a wattage matching your PSU, with at least 50W extra power for a standard monitor or small TV. Higher-efficiency power supplies will also come in handy here, since PCs rarely need to pull 100% power load from their PSUs. If you’re building a PC, and this is part of your building process, take a look at our power supplies guide as well. During an outage, your typical UPS battery will last anywhere from 30 minutes to an hour, depending on the load you’re putting it under. This should be enough time to safely shut down your system in pretty much any scenario. Once power comes back on, your UPS battery will recharge… though in the case of AmazonBasic UPSes, you will need to manually reset the system to switch back to wall power first. An important factor to consider when buying an uninterruptible power supply is its software. Every uninterruptible power supply we’ve listed provides software you can use to monitor the UPS. If you’re a PC user, this software can also be used to automatically shut down your PC once the UPS power backup battery life is low, which is especially great if you aren’t around to turn off the PC yourself. Aside from this basic functionality, higher-end software will also provide superior monitoring and control features. In terms of interface, a USB interface is the standard. You’ll see a USB interface for every UPS on this list, with the exception of a model that also offers serial connectivity. Note: If your battery dies after your warranty period has passed, you won’t get a free replacement. You’ll need to buy it instead. Your warranty is fairly important here– be sure to register your UPS properly! Your warranty will cover both your battery and the uninterruptible power supply unit itself. If either fails within the specified warranty period, you’ll be entitled to a replacement from the manufacturer. A 3 year warranty is standard, and this warranty period corresponds to the battery life expectations for your standard UPS battery.